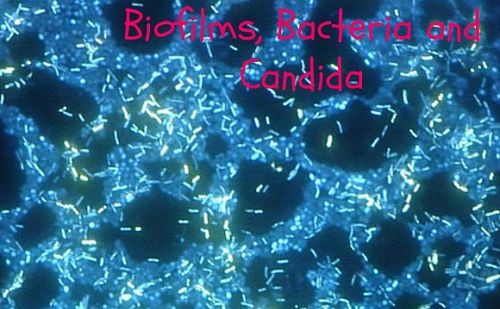 A biofilm starts with a single bacteria. When conditions are ideal, that single bacteria will split and divide into two bacteria. Those two bacterium then split and divide, on and on. It is possible that one bacteria can divide into one million in only 10 hours. Now we have a large group community of bacteria. These groups of bacteria will grow on anything wet and tend to grow in places where they're not wanted. So think plaque on your dog's teeth or slime in your drain. These are only two examples of how strong bacteria groupings form in the body, and also in our surrounding environment. This makes treating a yeast infection or any other chronic infection very difficult. Getting past the protective slime is a real pain. The microbes contained within the slime are constantly changing. They are very smart and have inherent intelligence which enables them to survive and evade treatments of any kind which could potentially reduce their numbers or kill them off entirely. This is called ' resistance '. It is well known now, that many chronic infections have become ' antibiotic resistant '. A resistant biofilm community that forms around the candida yeast overgrowth in your dog's gut will make getting rid of that yeast infection very difficult. This is why it takes such a long time to get over it. It is hard work breaking through the protective everchanging biofilm. So it goes without saying, that we must break through the slime before we can effectively get to the yeast infection. 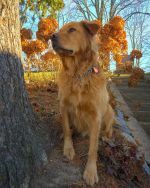 When the community of microbiota, which includes fungi, such as candida, bacteria, viruses, parasites and protists ( think protozoan giardia ) becomes out of balance, a war starts in your dog's gut. There are some good guys, and there are some bad guys. These good and bad microbes are not living in harmony. The bad guys are winning because there is strength in their evergrowing numbers. The bad bacteria or other pathogenic microbes are forming large protective communities of slime out of glucose and proteins. The candida fungus thrives behind the protective surrounding matrix of sugary slime. You can see that in the picture above. Look at the light blue areas. The hero in this story is the healthy, thin layer of mucus lining your dog's gut. This is also a biofilm, but is made up of the healthy bacteria microflora needed to absorb nutrients through the intestinal wall and keep the passage moist, lubricated and free of inflammation. So our goal is threefold..
using a carbohydrate free ketogenic diet to starve the slimy bacteria and yeast fungus that need glucose to survive.